Charles Dickens Biography : CHAPTER II. BIOGRAPHY OF CHARLES DICKENS: CHAPTER II. Dickens cannot have been very long at Wellington House Academy, for before May, 1827, he had been at another school near Brunswick Square, and had also obtained, and quitted, some employment in the office of a solicitor in New Square, Lincoln's Inn Fields. It seems clear, therefore, that the whole of his school life might easily be computed in months; and in May, 1827, it will be remembered, he was still but a lad of fifteen. At that date he entered the office of a second solicitor, in Gray's Inn this time, on a salary of thirteen shillings and sixpence a week, afterwards increased to fifteen shillings. Here he remained till November, 1828, again picking up a good deal of information that cannot perhaps be regarded as strictly legal, but such as he was afterwards able to turn to admirable account. He would seem to have studied the profession exhaustively in all its branches, from the topmost Tulkinghorns and Perkers, to the lowest pettifoggers like Pell and Brass, and also to have given particular attention to the parasites of the law--the Guppys and Chucksters; and altogether to have stored his mind, as he had done at school, with a series of invaluable notes and observations. All very well, no doubt, as we look at the matter now. But then it must often have seemed to the ambitious, energetic lad, that he was wasting his time. Was he to remain for ever a lawyer's clerk who has not the means to be an articled clerk, and who can never, therefore, aspire to become a full-blown solicitor? Was he to spend the future obscurely in the dingy purlieus of the law? His father, in whose career "something," as Mr. Micawber would have said, had at last "turned up," was now a reporter for the press. The son determined to be a reporter too. He threw himself into this new career with characteristic energy. Of course a reporter is not made in a day. It takes many months of drudgery to obtain such skill in shorthand as shall enable the pen of the ready-writer to keep up with the winged words of speech, and make dots and lines that shall be readable. Dickens laboured hard to acquire the art. In the intervals of his work he made it a kind of holiday task to attend the Reading-room of the British Museum, and so remedy the defects in the literary part of his education. But the best powers of his mind were directed to "Gurney's system of shorthand." And in time he had his reward. He earned and justified the reputation of being one of the best reporters of his day. I shall not quote the autobiographical passages in "David Copperfield" which bear on the difficulties of stenography. The book is in everybody's hands. 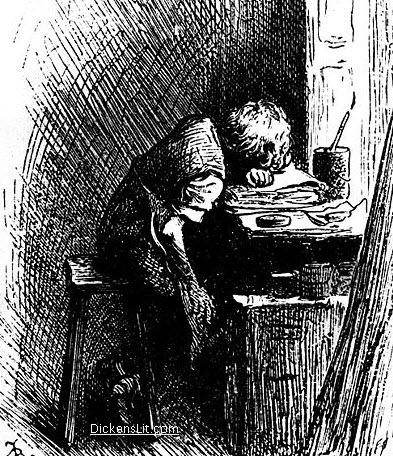 But I cannot forego the pleasure of brightening my pages with Dickens' own description of his experiences as a reporter, a description contained in one of those charming felicitous speeches of his which are almost as unique in kind as his novels. Speaking in May, 1865, as chairman of a public dinner on behalf of the Newspaper Press Fund, he said: "I have pursued the calling of a reporter under circumstances of which many of my brethren at home in England here, many of my modern successors, can form no adequate conception. I have often transcribed for the printer, from my shorthand notes, important public speeches, in which the strictest accuracy was required, and a mistake in which would have been, to a young man, severely compromising, writing on the palm of my hand, by the light of a dark lantern, in a post-chaise and four, galloping through a wild country, and through the dead of the night, at the then surprising rate of fifteen miles an hour. The very last time I was at Exeter, I strolled into the castle-yard there to identify, for the amusement of a friend, the spot on which I once took, as we used to call it, an election speech of my noble friend Lord Russell, in the midst of a lively fight maintained by all the vagabonds in that division of the county, and under such pelting rain, that I remember two good-natured colleagues, who chanced to be at leisure, held a pocket-handkerchief over my note-book, after the manner of a State canopy in an ecclesiastical procession. I have worn my knees by writing on them on the old back row of the old gallery in the old House of Commons; and I have worn my feet by standing to write in a preposterous pen in the old House of Lords, where we used to be huddled together like so many sheep, kept in waiting, say, until the woolsack might want re-stuffing. Returning home from excited political meetings in the country to the waiting press in London, I do verily believe I have been upset in almost every description of vehicle known in this country. I have been, in my time, belated in miry by-roads, towards the small hours, forty or fifty miles from London, in a wheel-less carriage, with exhausted horses, and drunken postboys, and have got back in time for publication, to be received with never-forgotten compliments by the late Mr. Black, coming in the broadest of Scotch from the broadest of hearts I ever knew." What shall I add to this? That the papers on which he was engaged as a reporter, were The True Sun, The Mirror of Parliament, and The Morning Chronicle; that long afterwards, little more than two years before his death, when addressing the journalists of New York, he gave public expression to his "grateful remembrance of a calling that was once his own," and declared, "to the wholesome training of severe newspaper work, when I was a very young man, I constantly refer my first success;" that his income as a reporter appears latterly to have been some five guineas a week, of course in addition to expenses and general breakages and damages; that there is independent testimony to his exceptional quickness in reporting and transcribing, and to his intelligence in condensing; that to an observer so keen and apt, the experiences of his business journeys in those more picturesque and eventful ante-railway days must have been invaluable; and, finally, that his connection with journalism lasted far into 1836, and so did not cease till some months after "Pickwick" had begun to add to the world's store of merriment and laughter. 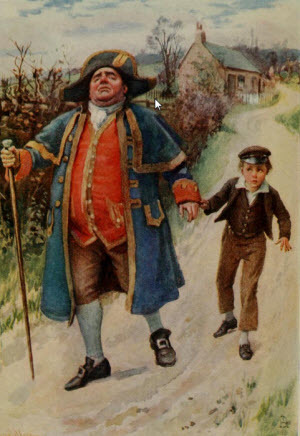 But I have not really reached "Pickwick" yet, nor anything like it. That master-work was not also a first work. With all Dickens' genius, he had to go through some apprenticeship in the writer's art before coming upon the public as the most popular novelist of his time. Let us go back for a little to the twilight before the full sunrise, nay, to the earliest streak upon the greyness of night, to his first original published composition. Dickens himself, and in his preface to "Pickwick" too, has told us somewhat about that first paper of his; how it was "dropped stealthily one evening at twilight, with fear and trembling, into a dark letter-box, in a dark office, up a dark court in Fleet Street;" how it was accepted, and "appeared in all the glory of print;" and how he was so filled with pleasure and pride on purchasing a copy of the magazine in which it was published, that he went into Westminster Hall to hide the tears of joy that would come into his eyes. The paper thus joyfully wept over was originally entitled "A Dinner at Poplar Walk," and now bears, among the "Sketches by Boz," the name of "Mr. Minns and his Cousin"; the periodical in which it was published was The Old Monthly Magazine, and the date of publication was January 1, 1834. "A Dinner at Poplar Walk" may be pronounced a very fairly told tale. It is, no doubt, always easy to be wise after the event, in criticism particularly easy, and when once a writer has achieved success, there is but too little difficulty in showing that his earlier productions were prophetic of his future greatness. At the risk, however, of incurring a charge of this kind, I repeat that Dickens' first story is well told, and that the editor of The Old Monthly Magazine showed due discernment in accepting it and encouraging his unknown contributor to further efforts. Quite apart from the fact that the author was only a young fellow of some two or three and twenty, both this first story and the stories that followed it in The Old Monthly Magazine, during 1834 and the early part of 1835, possessed qualities of a very remarkable kind. So also did the humorous descriptive papers shortly afterwards published in The Evening Chronicle, papers that, with the stories, now compose the book known as "Sketches by Boz." Sir Arthur Helps, speaking of Dickens, just after Dickens' death, said, "His powers of observation were almost unrivalled.... Indeed, I have said to myself when I have been with him, he sees and observes nine facts for any two that I see and observe." This particular faculty is, I think, almost as clearly discernible in the "Sketches" as in the author's later and greater works. London--its sins and sorrows, its gaieties and amusements, its suburban gentilities, and central squalor, the aspects of its streets, and the humours of the dingier classes among its inhabitants,--all this had certainly never been so seen and described before. The power of exact minute delineation lavished upon the picture is admirable. Again, the dialogue in the dramatic parts is natural, well-conducted, characteristic, and so used as to help, not impede, the narrative. The speech, for instance, of Mr. Bung, the broker's man, is a piece of very good Dickens. Of course there is humour, and very excellent fooling some of it is; and equally, of course, there is pathos, and some of that is not bad. Do I mean at all that this earlier work stands on the same level of excellence as the masterpieces of the writer? Clearly not. It were absurd to expect the stripling, half-furtively coming forward, first without a name at all, and then under the pseudonym of Boz, to write with the superb practised ease and mastery of the Charles Dickens who penned "David Copperfield." By dint of doing blacksmith's work, says the French proverb, one becomes a blacksmith. The artist, like the handicraftsman, must learn his art. Much in the "Sketches" betrays inexperience; or, perhaps, it would be more just to say, comparative clumsiness of hand. The descriptions, graphic as they undoubtedly are, lack for the most part the final imaginative touch; the kind of inbreathing of life which afterwards gave such individual charm to Dickens' word-painting. The humour is more obvious, less delicate, turns too readily on the claim of the elderly spinster to be considered young, and the desire of all spinsters to get married. The pathos is often spoilt by over-emphasis and declamation. It lacks simplicity. For the "Sketches" published in The Old Monthly Magazine, Dickens got nothing, beyond the pleasure of seeing himself in print. The Chronicle treated him somewhat more liberally, and, on his application, increased his salary, giving him, in view of his original contributions, seven guineas a week, instead of the five guineas which he had been drawing as a reporter. Not a particularly brilliant augmentation, perhaps, and one at which he must often have smiled in after years, when his pen was dropping gold as well as ink. Still, the addition to his income was substantial, and the son of John Dickens must always, I imagine, have been in special need of money. Moreover the circumstances of the next few months would render any increased earnings doubly pleasant. For Dickens was shortly after this engaged to be married to Miss Catherine Hogarth, the daughter of one of his fellow-workers on the Chronicle. There had been, so Forster tells us, a previous very shadowy love affair in his career,--an affair so visionary indeed, and boyish, as scarcely to be worthy of mention in this history, save for three facts: first, that his devotion, dreamlike as it was, seems to have had love's highest practical effect in inducing him to throw his whole strength into the study of shorthand; secondly, that the lady of his love appears to have had some resemblance to Dora, the child-wife of David Copperfield; and thirdly, that he met her again long years afterwards, when time had worked its changes, and the glamour of love had left his eyes, and that to that meeting we owe the passages in "Little Dorrit" relating to poor Flora. This, however, is a parenthesis. The engagement to Miss Hogarth was neither shadowy nor unreal--an engagement only in dreamland. Better for both, perhaps--who knows?--if it had been. Ah me, if one could peer into the future, how many weddings there are at which tears would be more appropriate than smiles and laughter! Would Charles Dickens and Catherine Hogarth have foreborne to plight their troth, one wonders, if they could have foreseen how slowly and surely the coming years were to sunder their hearts and lives?--They were married on the 2nd of April, 1836. This date again leads me to a time subsequent to the publication of the first number of "Pickwick," which had appeared a day or two before;--and again I refrain from dealing with that great book. 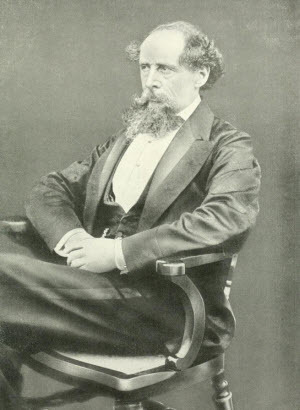 For before I do so, I wish to pause a brief space to consider what manner of man Charles Dickens was when he suddenly broke on the world in his full popularity; and also what were the influences, for good and evil, which his early career had exercised upon his character and intellect. What manner of man he was? In outward aspect all accounts agree that he was singularly, noticeably prepossessing--bright, animated, eager, with energy and talent written in every line of his face. 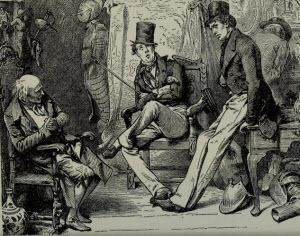 Such he was when Forster saw him, on the occasion of their first meeting, when Dickens was acting as spokesman for the insurgent reporters engaged on the Mirror. So Carlyle, who met him at dinner shortly after this, and was no flatterer, sketches him for us with a pen of unwonted kindliness. "He is a fine little fellow--Boz, I think. Clear, blue, intelligent eyes, eyebrows that he arches amazingly, large protrusive rather loose mouth, a face of most extreme mobility, which he shuttles about--eyebrows, eyes, mouth and all--in a very singular manner while speaking. Surmount this with a loose coil of common-coloured hair, and set it on a small compact figure, very small, and dressed à la D'Orsay rather than well--this is Pickwick. For the rest, a quiet, shrewd-looking little fellow, who seems to guess pretty well what he is and what others are." Is not this a graphic little picture, and characteristic even to the touch about D'Orsay, the dandy French Count? For Dickens, like the young men of the time--Disraeli, Bulwer, and the rest--was a great fop. We, of these degenerate days, shall never see again that antique magnificence in coloured velvet waistcoats. But to return. Dickens, it need scarcely be said, had by this [time] long out-lived the sickliness of his earlier years. The hardships and trials of his childhood and boyhood had served but to brace his young manhood, knitting the frame and strengthening the nerves. Light and small, as Carlyle describes him, he was wiry and very active, and could bear without injury an amount of intellectual work and bodily fatigue that would have killed many men of seemingly stronger build. And as what might have seemed unfortunate in his youth had helped perchance to develop his physical powers, so had it assisted to strengthen his character and foster his genius. I go back here to the point from which I started. No doubt a weaker man would have been crushed by such a youth. He would have been indolently content to remain a warehouse drudge, would have listlessly fallen into his father's ways about money, would have had no ambition beyond his desk and salary as a lawyer's clerk, would have never cared to piece together and supplement the scattered scraps of his education, would have rested on his oars when he had once shot into the waters of ordinary journalism. With Dickens it was not so. The alchemy of a fine nature had transmuted his disadvantages into gold. To him the lessons of such a childhood and boyhood as he had had, were energy, self-reliance, a determination to overcome all obstacles, to fight the battles of life, in all honour and rectitude, so as to win. From the muddle of his father's affairs he had taken away a lesson of method, order, and punctuality in business and other arrangements. "What is worth doing at all is worth doing well," was not only one of his favourite maxims--it was the rule of his life. And for what was to be his life work, what better preparation could there have been than that which he received? I am far from recommending warehouses, squalid solitary lodgings, pawnshops, debtors' prisons,--if such could now be found,--ill-conducted private schools,--which probably could be found,--attorneys' offices, and the hand-to-mouth of journalism, as constituting generally the highest ideal of a liberal education. I am equally far from asserting that the majority of men do not require more training of a purely scholastic kind than fell to Dickens' lot. But Dickens was not a bookish man. His genius did not lie in that direction. To have forced him unduly into the world of books would have made him, doubtless, an average scholar, but might have weakened his hold on life. Such a risk was certainly not worth the running. Fate arranged it otherwise. What he was above all was a student of the world of men, a passionately keen observer of the ways of humanity. Men were to be his books, his special branch of knowledge; and in order to graduate and take high honours in that school, I repeat, he could have had no better training. Not only had he passed through a range of most unwonted experiences, experiences calculated to quicken to the uttermost his superb faculties of observation and insight; but he had been placed in sympathetic communication with a strange assortment of characters, lying quite out of the usual ken of the literary classes. Knowledge and sympathy, the seeing eye and the feeling heart--were these nothing to have acquired? That so abnormal an education can have been entirely without drawbacks, it is no part of my purpose to affirm. Tossed, as one may say, to sink or swim amid the waves of life, where those waves ran turbid and brackish, Dickens had emerged strengthened, triumphant. But that some little signs should not remain of the straining and effort with which he had won the land, was scarcely to be expected. He himself, in his more confidential communications with Forster, seems to avow a consciousness that this was so; and Forster, though he speaks guardedly, lovingly, appears to be of opinion that a certain self-assertiveness and fierce intolerance of advice or control occasionally discernible in his friend, might justly be attributed to the harsh influence of early struggles and privations. But what then? That system of education has yet to be devised which shall mould this poor human clay of ours into flawless shapes of use and beauty. A man may be considered fortunate indeed, when his training has left in him only what the French call the "defects of his virtues," that is, the exaggeration of his good qualities till they turn into faults. Without his immense strength of purpose and iron will, Dickens might never have emerged from obscurity, and the world would have been very distinctly the poorer. One cannot be very sorry that he possessed these gifts in excess. And now, at last, having slightly sketched the history of his earlier years, and endeavoured to show, however perfectly, what influences had gone to the formation of his character, I proceed to consider the book that lifted him to fame and fortune. The years of apprenticeship are over, and the master-workman brings forth his finished work in its flower of perfection. Let us study "Pickwick." It was the pet name of one of his brothers; that was why he took it. Froude's "Thomas Carlyle: A History of his Life in London." Transcriber's Note: The word "time" appears to be missing from the original text. "I have heard Dickens described by those who knew him," says Mr. Edmund Yates, in his "Recollections," "as aggressive, imperious, and intolerant, and I can comprehend the accusation.... He was imperious in the sense that his life was conducted on the sic volo sic jubeo principle, and that everything gave way before him. The society in which he mixed, the hours which he kept, the opinions which he held, his likes and dislikes, his ideas of what should or should not be, were all settled by himself, not merely for himself, but for all those brought into connection with him, and it was never imagined they could be called in question.... He had immense powers of will."